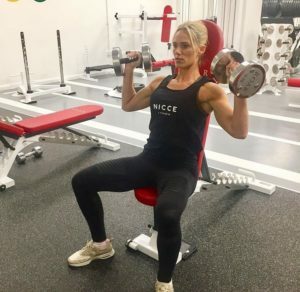 With the ever increasing popularity of women looking to posses both a strong and athletic figure, there are perhaps a few particularly desirable muscle groups that sit at the top of everyone’s wish list. Well rounded glutes, defined arms and a super toned mid section will generally be a priority, but if you really want the complete look then you’ll need to work hard to build a set of nicely sculpted shoulders. It doesn’t matter whether you are in your gym gear or all dressed up for a big night on the town, a well developed set of shoulders will go a long way to enhancing your athletic look whilst letting everyone know you work hard for that body. Here are a few key exercises our London personal trainers use to build a strong and well balanced set of shoulders with their clients. This is a power exercise for the upper body and great for building the anterior portion of the deltoids (shoulders). It also requires you to work the core extremely hard in order to keep your spine in a safe position. Start with the barbell just below your chin, and without bending your knees and cheating by using your legs, press the bar directly above your head with as much force as you can, then slowly lower the bar for a 4 count and repeat. Start with 11-13 reps for 3 sets. If you find the Olympic bar too heavy (20kg) your gym may have a smaller 10kg barbell, or failing that substitute it for dumb bells. This is a great exercise for helping to build separation of the shoulder from the upper arm. It predominately focuses on the medial portion of the deltoid and is more of an isolation exercise, as apposed to overhead pressing which includes assistance from the tricep muscles. You can do this exercise either standing or seated, but if standing try to avoid using momentum from your torso and swinging the weights up. Start with the dumb bells by your side and squeeze the weight up (rather than powering it up quickly) keeping your elbows ever so slightly bent. At the top of the movement think about the dumb bells as if you were grasping a glass of water, and tip the water out of the glass by rotating your forearms so the thumbs are turned slightly down. This will ensure you get a solid contraction of the medial deltoid. Then slowly lower the weight for a 4 count. Whilst we already have an overhead pressing move for the shoulders, variety is key, and the use of dumb bells not only ensures a different stimulus, it also eliminates the core being a limiting factor as to how much stress can be placed on the shoulders. Start with your wrists above your elbow and the inside of the dumb bell just above the shoulder. Squeeze the weights up above your head in a slight arching motion. At the top the dumb bells should be directly above your shoulders with the elbows just short of locking out. This exercise will focus on the posterior portion of the deltoid, which is often overlooked but essential for balance and the best overall aesthetic result. You can do this standing or seated, which requires you to bend at the hips to get in position, but we prefer our personal training clients to use the bench to fully support their upper body, which allows you to fully concentrate on the target muscle. Make sure the top of the bench ends at around your mid torso, so your neck and head are clear the bench, and try not to slouch or round the upper back. Keep around a 10 degree bend at the elbow joint and bring the weights out to the side of the body, keeping the elbow in line with your shoulder, don’t allow the hands to move down toward your waist. Give the back of your shoulders a little squeeze at the top of the movement and then control them back down for a 3 count.